"The subject of the accompanying illustration is a vendor of cough lozenges and healing ointment. He was originally a car-driver employed by a firm in the city, but had to leave his situation on account of failing sight. His story, told in his own words, is as follows :- "First of all I had to leave my place on account of bad sight. It was brought on by exposure to the cold. Inflammation set in the right eye and soon affected the left. The doctors called it 'atrophy.' I went to St. Thomas's Hospital for nine months, to St. George's Hospital, and to Moorfields Opthalmic Hospital. From St. Thomas's Hospital I was sent to the sea-side at the expense of the Merchant Taylors' Company. No good came of it all, and at last I was so blind that I had to be led about like a child. At that time my wife worked with her needle and her hands to keep things going. She used to do charing during the day and sewing at night, shirt-making for the friend of a woman who worked for a contractor. She got twopence-halfpenny for making a shirt, and by sitting till two or three in the morning could finish three shirts at a stretch. I stood at a street corner in the New Cut selling fish, and had to trust a good deal to the honesty of my Customers, as I could not see. "At this time I fell in with a gentleman selling ointment, he gave me a box, which I used for my eyes. I used the ointment about a month, and found my sight gradually returning. The gentleman who makes the ointment offered to set me up in business with his goods. I had no money, but he gave me everything on trust. It was a good thing for both of us, because I was a sort of standing advertisement for him and for myself. "I now make a comfortable living and have a good stock. When the maker of the ointment started he carried a tray; now he has three vans, and more than fifty people selling for him. 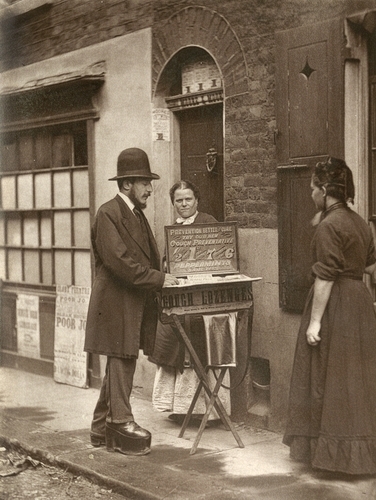 "I find the most of my customers in the street, but I am now making a private connexion at home of people from all parts of London. The prices for the Arabian Family Ointment, which can be used for chapped hands, lips, inflamed eyes, cuts, scalds, and sores, are from a penny to half-a-crown a box. Medicated cough lozenges a halfpenny and a penny a packet."